John M. wrote me to say: "The [Allentown] Art Museum Facebook person said you did a staff portrait - would you please post it so we in the general public can see it too? If it's up at the museum I'll see it in a couple of weeks when I can study the show." Here you go, John. It's not really a staff portrait; it's more a thank-you drawing. 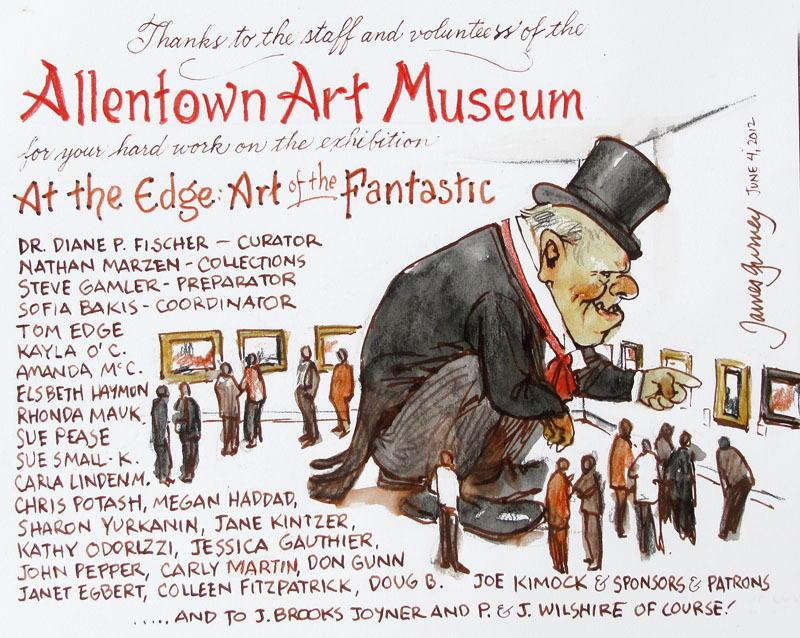 I sent the original sketch to the folks at the Allentown Art Museum who put together the new exhibit called "At the Edge: Art of the Fantastic." I wanted to acknowledge the members of the museum staff who worked hard to make this exhibit a success. In addition to the headline visionaries: Patrick and Jeannie Wilshire and J. Brooks Joyner, it takes a big team of professionals working behind the scenes— as well as the loyal docents and volunteers — to pull the whole thing off. Speaking merely as one of the participating artists, I should also acknowledge the sponsors and patrons, because without their support, the show would have been just a pipe dream. They include: Amaranth Foundation and The Leon C. and June W. Holt Endowment;The Audrey and Bernard Berman Endowment Fund; The Express-Times and LehighValleyLive.com; and WDIY 88.1FM, Lehigh Valley Community Public Radio, The Frank Foundation, Holiday Inn Center City Allentown, ICON, Laini's Little Pocket Guide, Lehigh Valley Woman, Sands Casino Resort, Greg Obaugh, Paul and LizAnn Lizotte, The Illustrated Gallery and Barry Klugerman. John, I'm glad you're making a trip to see the show. I hope you enjoy it as much as I did. Allentown Art Museum: "At the Edge: Art of the Fantastic"
Recap of show opening by Greg Manchess on the blog "Muddy Colors."